I dislike local news on UK television and the national news (especially on ITV) is often equally bad. There seems to be a conscious attempt to dumb-down any and all stories to an absurd lowest common clichéd denominator. The recent stories on the Blitz, unfortunately, fit into this category. 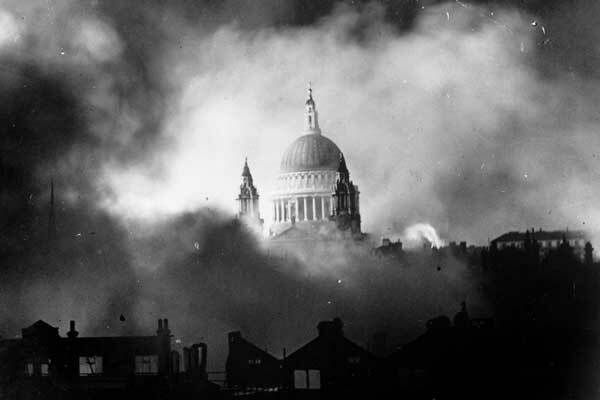 The 7th September 2010 is the 70th anniversary of the Blitz; when the German Luftwaffe began months of nightly raids on London and numerous other cities around the U.K. These raids finished in May 1941. By then, around 43,000 Londoners had been killed, the East End in particular had been decimated, and, for example, Coventry had been essentially wholly destroyed. From these raids, to my mind, two things emerged. First, the Royal Air Force (RAF) meted out the same punishment to numerous German cities including the decimation of Dresden and secondly, there emerged a pervasive myth. Notions of ‘plucky’ Londoners, going about their business, still dancing in shelters, unfazed and unaffected by the Blitz (German for lightening) highlighted Britain’s spirit against the Nazis. Whilst some of this is true; indeed, the Blitz did not at all break the spirit of Brits; people did carry on with a stoic resignation, this gets taken wholly too far. One aspect of the myth is that ‘all Londoners’ pulled together. That the class walls melted, everyone ‘mucked-in’ in the face of the Hun. Not quite. The upper class had either left for the countryside where they were wholly safe in their country estates or they were ensconced in comfortable, sanitary shelters in expensive London hotels or clubs. The lower classes had nothing. No public shelters (unlike in Berlin) had been created for fear of fostering an ‘underground’ mentality. Initially, authorities did not even want people to shelter on the tube, though this was soon relaxed. Though so-called Anderson shelters were distributed, whilst these might shelter you from shrapnel, were a bomb to fall in your vicinity, they’d have been as much use as putting a Styrofoam coffee-cup on your head for protection. While the government did begin to build some shelters in the streets, these were poorly constructed and quickly became fetid and wholly unsanitary. The myth of people carrying on as normal, partying and dancing heedless of Jerry’s dangers, was put about by Government propaganda, which incensed many people; they were hardly enjoying themselves cowering in squalid, half-shelters. Indeed, this precipitated the invasion of the Savoy Hotel on 15th September 1940 where people demanded to be sheltered. Is any of this covered in the news? No. Is it even hinted at? Not that I’ve seen. I can understand that this peddling of the myth is nice and comfortable for all concerned and while some might say that it’s patriotic to do so I’d disagree. I’ve no desire to tear-down British history and portray us in a negative light; there’s nothing at all wrong with admitting that the Blitz was more difficult for some than others. All I ask is a bit of context; for the other side of the argument. How many Brits know, for example, that horrific as the 43,000 Londoners killed in the 1940-1 Blitz undoubtedly is, roughly three times that number of people died on just one night of the fire-bombing of Tokyo? I’ve just stumbled on this article in The Guardian discussing – far better than me – the other side of the Blitz myth. Can I say that the Brits take their WW2 anniversaries ridiculously serious? Since I moved to London 3 years ago, it seems there’s a WW2 anniversary every month. The war ended 65 years ago. Get over it. That’s an exaggeration and harsh. It was a seminal moment in Britain’s history. Apologies if I sounded facetious. However I just don’t understand the UK’s constant commemoration of the war. I’m from India if it matters. Were you American I was going to remind you that the British war experience was categorically different to ‘yours’. For the UK it was an existential crisis of the first order which rid us of our Empire, destroyed swathes of our cities, killed millions and plunged us into a vast, deep and long-term economic crisis; we still had ration cards for food nearly a decade after the war finished. So, I just think that you’re glibly underestimating the profound effect that the war had. However, if you complained about the number of Nazi documentaries on cable TV here, I might be on your side.